Benefits of Podcasts —Are Companies In a Podcast-Buying Spree? Since the discovery of fire, one of mankind’s favorite pastimes has been to gather around a burning log and tell tales. 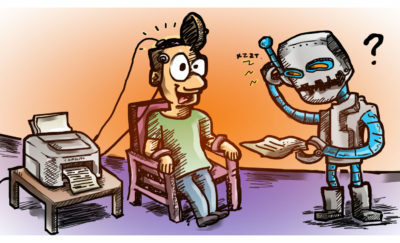 Of course, with the advent of the Internet and digital recordings, those spoken tales now take the form of podcasts. But the concept is the same! Someone is telling a story, and listeners are held in rapt attention as it unfolds. As such, the podcast phenomenon is gaining momentum on an international scale. Pioneers in the space have been taking advantage of the several benefits of podcasting for business. Bold Business explored the podcasts rising trend in September 2018. Nevertheless, it seems that the podcast craze is still on the road to a bright future. More businesses are investing in the industry because of the apparent benefits of podcasts for a company’s overall revenue and brand marketing. 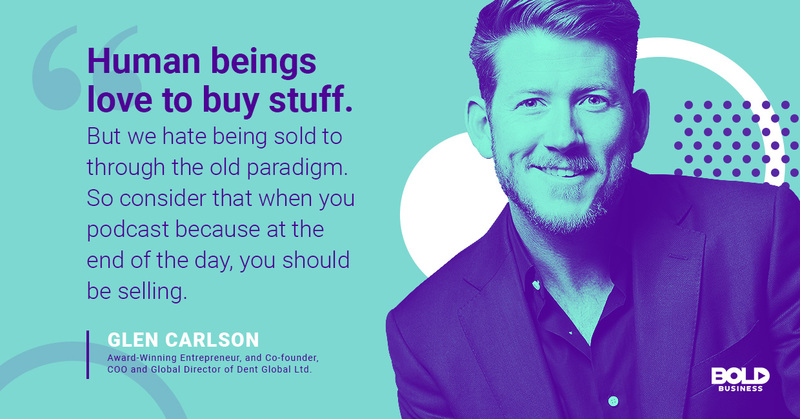 As the leader in the podcast-buying spree, Spotify is staying ahead of the game in cornering the podcast market – and highlighting the benefits of podcasting for business. 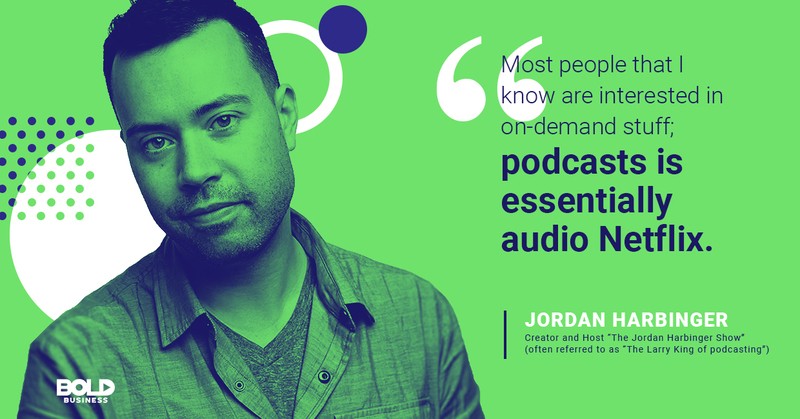 Jordan Harbinger gives his two cents on the reason why companies are now recognizing the benefits of podcasts. Based on recent statistics gathered by Podcast Insights for this year, 51 percent of the US has listened to a podcast. Monthly, 44 percent of the listeners are women, and 56 percent are men. And because one of the benefits of podcasts is its availability to consumers, the research group also discovered that 49 percent of podcast listening is done at home while 22 percent of listening is done in the car. Podcast Insights’ data also show that the percentages of the US who listen to podcasts monthly has seen a steady and substantial increase from 2013 until 2019. For instance, in a span of five years, 15 percent of podcasts listeners in the US in 2014 grew to about 24 percent in 2017 and then to 32 percent this year. These findings point to the fact that podcasts are becoming popular—albeit slowly but surely—and becoming ‘big business’ for many businesses, so to speak! More and more bold businesses are investing in the industry because of the apparent benefits of podcasts for a company. It’s really no surprise that the benefits of podcasting for business are primarily driving the popularity of podcasts up. Aside from being readily available to consumers everywhere, podcasts have other qualities that can be categorized as benefits of podcasting for business. Here are just three of the benefits of podcasts that businesses are initially now acknowledging and taking advantage. Podcasts help capture an audience for business and highlight the service or product of that business. As stated by Cyber World, one of the benefits of podcasting for business is that it offers an excellent platform for a company to share the know-how on its products or topics. Podcasts help generate higher traffic for a company’s business marketing. Podcasts are engaging in general—which is actually one of the initial benefits of podcasting for business. If a business is looking to expand its following among its customers, it can use podcasts as part of its marketing strategy. Podcasts can help boost your business’s overall revenue. Also, one of the benefits of podcasts is that they are not that expensive to create, compared to making videos. 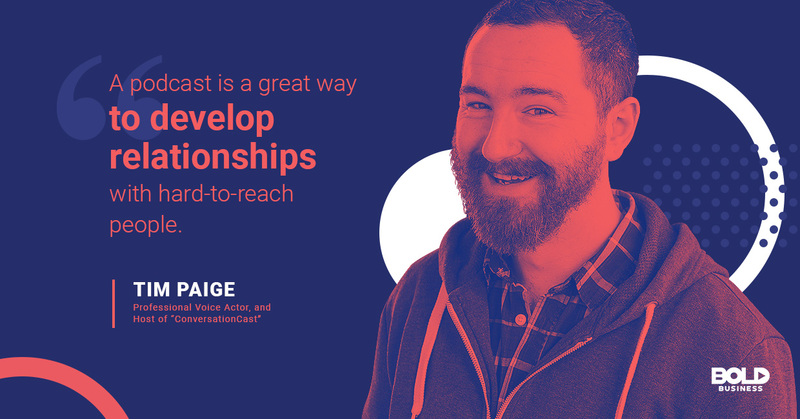 Tim Paige hits the mark by sharing his thoughts on one of the biggest benefits of podcasts. Because of the apparent benefits of podcasting for business, several companies have boldly taken the step in investing in podcasts through acquisitions and partnerships. Pioneers and long-standing companies have indeed been noting the benefits of podcasts and have, thus, been competing and expanding their reach in the process. Spotify is one of the most prominent audio- and music-streaming services in the world, with 83 million premium users. In addition, Spotify acquired two podcast-related networks in February—Gimlet and Anchor—and it discreetly confirming that it spent a little just under $340 million to do so. 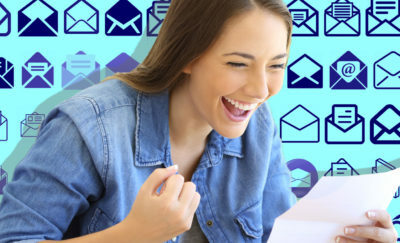 Gimlet is a narrative-producing podcast behind hit-shows such as “StartUp” and “Reply All”, while Anchor is a mobile podcast platform that eases the process for creators and advertisers to create, distribute and monetize podcasts. Furthermore, the audio and music giant announced just recently that it is acquiring Parcast, an L.A.-based entertainment audio podcast known for its podcast series on crime, mystery, history genres and science fiction. 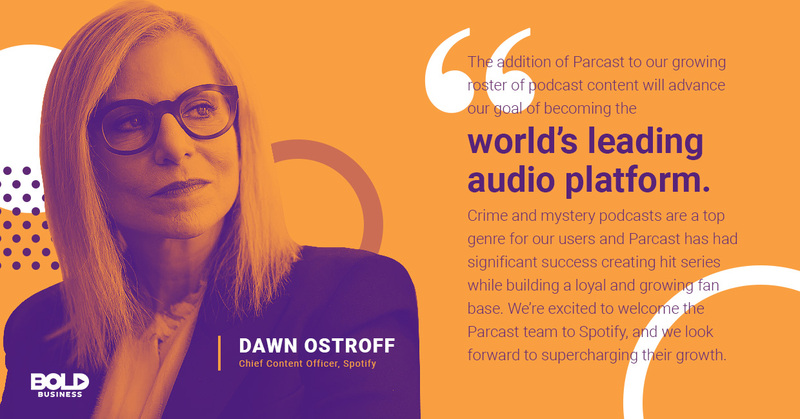 Dawn Ostroff expresses their excitement at Spotify in acquiring Parcast and including the company to their growing platform. Indeed, these acquisitions have numerous implications for both the company and the industry. For Spotify, expanding its podcast catalog also means an increase in the overall time spent by users of the platform. With the acquisition of Parcast and Gimlet, Spotify gains broader and more extensive content that it can offer to old and new users. With its acquisition of Anchor, it can also provide a whole array of tools that aid content creation, which certainly counts as one of the benefits of podcasting for business. Such details solidify Spotify as an end-to-end podcast pipeline and show the revenue potential of the podcasting industry in the mobile-first era. Apple is one of the earliest drivers of the podcasting community, going all the way back to 2004. The name “podcast” itself was derived from Apple’s iPod. However, with the entry of other big players in the market, Apple’s market share experienced a decline from 70 percent in 2015 to 55 percent in 2017. Nevertheless, in December 2017, Apple announced its acquisition of Pop Up Archive—a startup founded in 2012—which serves as an online platform that specializes in the development of tools that transcribe, organize and search audio files. With this acquisition, Apple has acquired a technology—called Audiosear.ch—that would allow it increased capability to organize and sift through its library of podcasts and improve the searchability of the hundreds of thousands of shows it distributes through the Apple Podcast. Pioneers and long-standing companies have been noting the benefits of podcasts – and have been competing and expanding their reach in the process. Another company that recognizes the benefits of podcasting for business is Veritone One. In August 2018, the company announced its acquisition of Performance Bridge. Veritone One creates native and traditional advertising, with its expertise on media buying, planning and creative development coupled with its patented aiWARE technology. 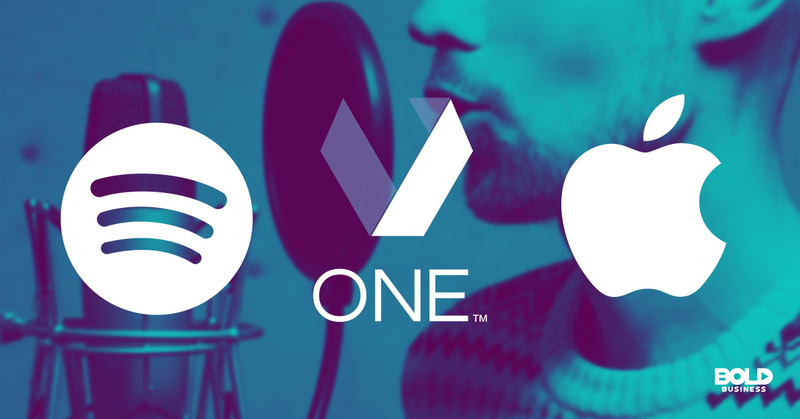 The move by Veritone One combines Performance Bridge’s historic knowledge of podcast campaign performance and Veritone One’s aiWARE technology. This case ultimately enhances the company’s ad tracking and podcast targeting capabilities for brands. It will also increase Veritone One’s market share to over 25 percent of all U.S.-based podcast ad revenue—a definite picture of one of the many benefits of podcasting for business. iHeartMedia is one of the leading media companies in the United States, which owns and operates 858 broadcast radio stations, boasting over 250 million monthly listeners. It delivers a wide variety of content—music, news, sports and talk—across various platforms. Its platform has over 100 million registered users and broadcasts thousands of live radio stations and podcasts from across the U.S. In September 2018, iHeartMedia announced its acquisition of Stuff Media, a pioneer in podcasting, and the world’s leading podcast publisher, for a reported price of $55 million. Stuff Media owned the “HowStuffWorks” podcasting business, alongside 55 other podcast shows. Certainly, the coupling of the two will allow iHeartMedia to capitalize on the advertising revenue potential of a nascent podcast industry. These four companies have moved towards the direction of utilizing the benefits of podcasts. 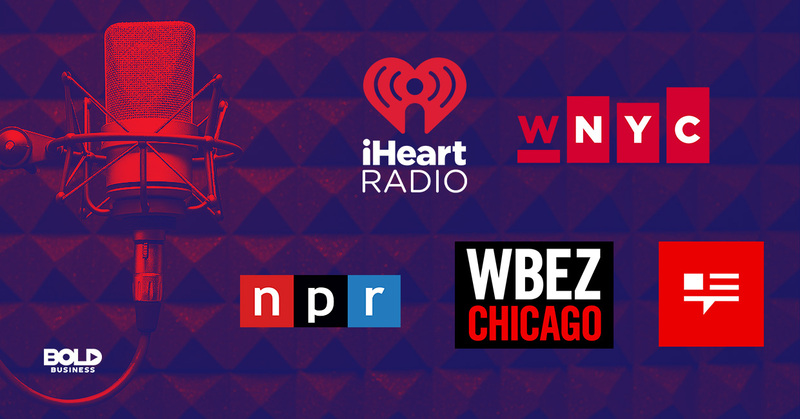 Finally, the National Public Radio (NPR), WNYC Studios, WBEZ Chicago and This American Life have joined forces to acquire Pocket Casts, a paid podcast application that manages podcast listening across multiple mobile and web platforms. Together, the four companies accumulate over 170 million monthly downloads, partly because of the popularity of their podcasts. No financial details of the acquisition are available. But the idea behind multiple groups forming together to acquire Pocket Casts is to run it as a joint venture. Although all four companies are already established players in the podcasting industry, acquiring Pocket Casts enables them to reach more users and to forge closer relationships with podcast listeners and producers. The move offers benefits of podcasting for business that will also allow a faster, better and more efficient experience of podcast discovery, delivery, distribution, and monetization. It would make sense for companies to invest in the benefits of podcasting for business to increase their reach and boost their revenue. Thus, it would make sense for businesses to invest in the space. And with Spotify leading the charge, their success will guide others who want to maximize their revenue and brand strength.